So like many people, I have had several dreams in life. A goal so massive that it requires other people’s help to accomplish. I like to think that aspirations like these are best shared with others. My dream was to help people achieve freedom with food. Food is control; food is freedom. If you are dependent on other people or a third party to satisfy your food needs you will not have the same level of freedom as someone that produces a majority of their own food. I don’t believe we can be 100% self-sustaining with all our food needs, but I think we can get close. Especially building community around food production. When you can produce your own meat, fruit and vegetables you control how they are grown and thus you control what goes into your body. You also gain the freedom to have more influence on your quality of life. Now imagine doing this for a living and building a successful business at the same time. That’s not necessarily the dream for me, but helping others is. Not everyone has the monetary resources to purchase 20 acres of land and fast track a food production business. That’s where my dream comes in. I wanted to create a company that purchases land, helps make permanent improvements, leases it out and aids in successful business development. I needed to prove the model first. I made two companies, bought 20 acres and started the process at the beginning of this year. The first company is the investment company that purchased the 20 acres. It’s main responsibility is to ensure any permanent needs are met: water, septic, electricity, buildings, fencing and access. So the actual electrical service is the responsibility of the lessee, but setting up the service is the first company’s job. All expenses are metered out based on depreciation schedule based on IRS standards (more on this later). Any expenses generated from the initial setup are calculated in the lease payment. All business is conducted above board with transparency to taxing agencies. The second company leases the land from the first company. This company is responsible for anything temporary or anything that could be moved to another piece of land. Animals, feed, cages, temporary fencing, electrical service, trash service, internet, etc. is their obligation to meet. This company uses the land and available resources to build a profitable food production business. The investment company aids the food production company with loans, a comforatble lease payment schedule, business and marketing training and possibly even leasing equipment. At the end of three or four years, the food production company gets first right of refusal to purchase the land. The investment company gets fair market value for the land and moves on to another of the same project. The leaf structure was that of a cantaloupe. I had ran out of compost during the followup part of the project. I used my own compost that I had made in the back yard. Interestingly enough, not all the seed from a store bought cantaloupe had been “cooked” in the composting process. What resulted was an amazing growth represented in the picture below. That is one plant that yielded 48 melons. Amazing production and a true testament to the power of permaculture! These melons were the most tasty cantaloupe I had ever tasted. There must have been some amazing biology going on in the soil. I was able to sell a few to co-workers, because they smelled and tasted so good. Bear in mind that the original soil in this area was fill dirt brought in after construction. 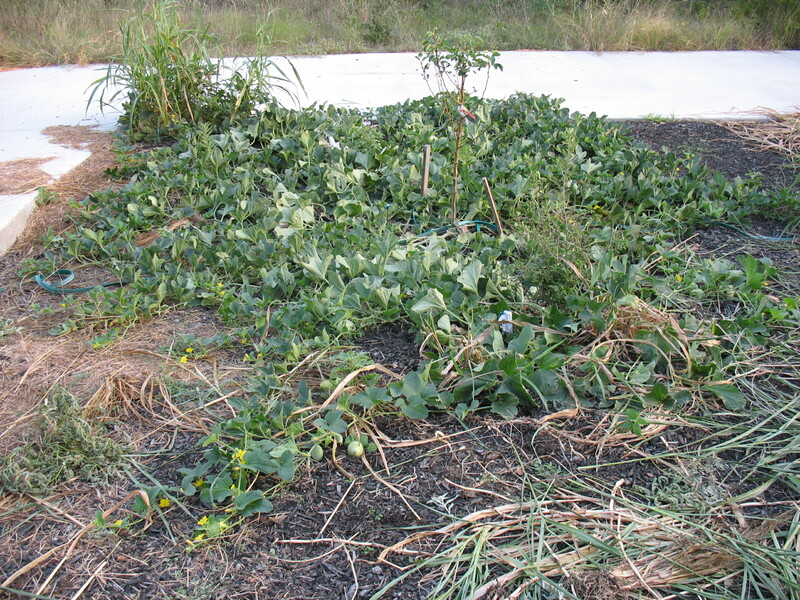 This base along with the lasagna structure of fertility fostered a prime growing environment for the cantaloupe. A pretty cool accident. Categories: Projects, Uncategorized | Tags: Permaculture, Sheet Mulching | Permalink. In my journey for knowledge I happened upon a website that I have learned a lot about Texas edibles. I knew there was a veritable medicine cabinet in my yard, but I didn’t have a resource to tap it. Thanks to a podcast by Jack Spirko at http://www.thesurvivalpodcast.com, I learned about http://www.foragingtexas.com. I already knew that Plantain, sometimes called Greater Plantain, was great for bug bites and stings. I had a couple of chigger bites on my leg from watering the garden one night. I took a couple of plantain leaves and rolled them together to get them to “juice up”. I then rubbed the afflicted areas with the green pulp. In seconds the swelling from the bites subsided. The next morning it was hardly noticeable where I was bit. I took a picture of a plantain plant in my back yard. We were nearing the end of the season for this plant. The Texas sun and heat makes them go to seed quick. If you want to extend your season for plantain I would recommend that you plant it in pots and keep them in a shady, cool area. The above picture is from the north side of my house. Its cool and shady on that spot, so it prolonged the life cycle of the plant. Notice the exposed “cobs” in the foreground of the picture. They look like spiny corn on the cob. They are dried out and the cobs in the back are shaded by other growth; they are green. I saw this plant everywhere when I learned about it. DISCLAIMER: I am not a doctor or an herbalist. Please seek the counsel of your doctor or herbalist before undertaking any self-taught remedies. About the time I was researching this plant, my girlfriend had the worst chest cough I had ever seen her experience. She couldn’t shake it. Worst yet, she had chest congestion that wouldn’t shake loose. I made some tea with plantain leaves and the next day she started to have productive coughs. I was really impressed, but not completely convinced. We also went up to Natural Grocers in Cedar Park and bought her a herbal cough remedy as well. Cue one of my co-workers the next week. He was going on his third week of a non-productive dry cough. I made some tea for him too and the next day he was remarkably better. I didn’t give him the herbal cough remedy that we bought since it was for wet, unproductive coughs. I was really convinced at this point. To make tea you break the leaves off, about 4 good sized will do. Wash them up real good. You will tear them into 1 inch by 1 inch pieces. Boil some water in a separate container and place the leaves in another pot. Pour the boiling water over the leaves and steep them over a low heat for 20 to 30 minutes. You don’t want to boil the water in this steeping process, but you want to have constant waves of steam rising from the pot. The longer you leave the heat on past 20 minutes the better. Leaving it on past 30 minutes will have diminishing returns. I went for 25 due to time. Remove from heat and strain out the leaves as you pour into your coffee cup. I used a little honey to sweeten. Unsweetened, it tastes like green bean water. So there you go. A cough remedy in your back yard. If anyone would like some seeds please contact me on the “about-contact” button and provide me a mailing address. I would be happy to mail you some seeds. 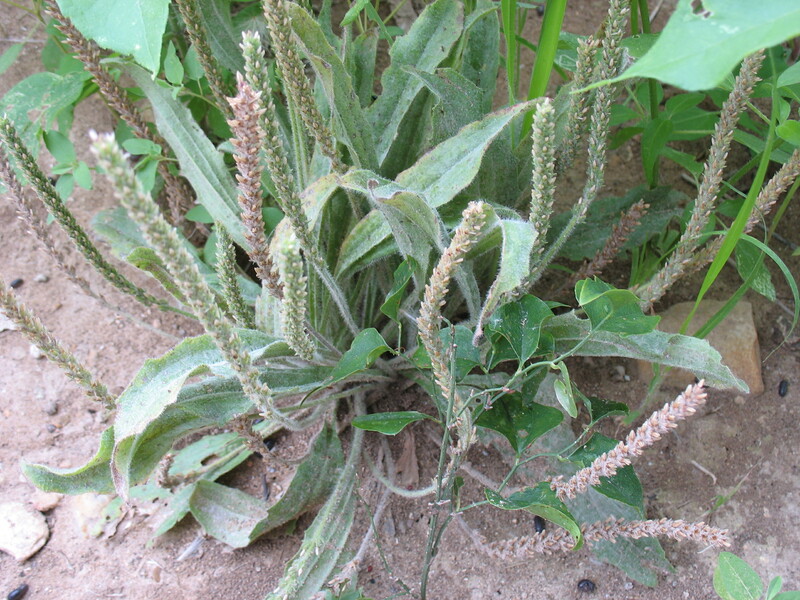 Plantain makes an excellent companion plant to any group of plantings. It will perform the role of herbaceous ground cover in a seven layer food forest. I will post later on food forestry. Enjoy nature’s resource! Categories: Resource, Uncategorized | Tags: Plantain | Permalink.